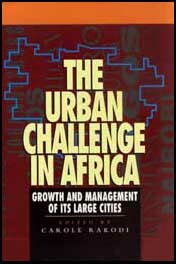 The urban challenge in Africa: growth and management of its large cities/edited by Carole Rakodi. 1. Cities and towns - Africa - Growth. 3. Urban policy - Africa. I. Rakodi, Carole. 7 Kinshasa: A reprieved mega-city?